Download our Free Love Mum Template and create this fab Mother’s day card, cover the front of a 6x6 card blank with First Edition Paper Flowers geometric print paper. Cut a 12x12cm square of Purple glitter card and fix to the centre of your card. Trim a 13.5x13.5cm piece of floral print card, use the template to cut the letters and heart out and mount to the card base using foam squares. Finish with Gems in each corner. I definitely had fun making and personalising these fun Mother’s day keyring’s. Easy to make using air dry clay and our Dovecraft 99p Stamps, emboss your design into the clay and use baking cutters to shape the designs, create a hole for the key ring chain. When dry, sand the edges smooth and paint with DecoArt chalky paint then embellish with glitter glue and pearls. Fix to a keyring chain and give to Mum! 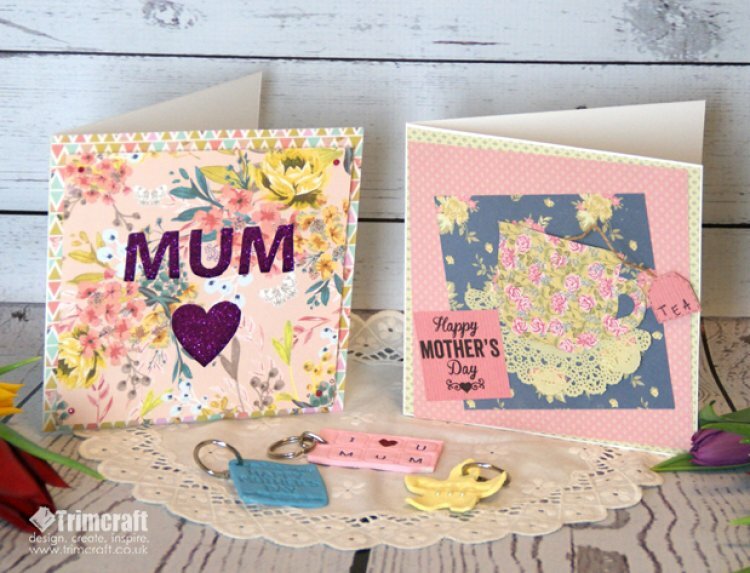 Perfect for Mum’s who love tea, I made this card using the Dovecraft Leyton papers, cut a piece of the green backing paper 14.5cm x 14.5cm, layer with a piece of pink backing paper cut to 14cm x14cm, stick on an angle. Stick a piece of blue backing paper to the centre of the card. Next cut a doily in half and stick down. Cut a teacup shape out of green floral paper. Stamp the Mother’s Day sentiment & add to the bottom left corner. Make a small tag shape out of the pink backing paper, use a marker to add stitching and use the alphabet stamps to spell out the word TEA, add twine to the back and put the other end into the cup. Show us what you have made for your Mum in the Project gallery, where there is plenty more inspiration to inspire you there.